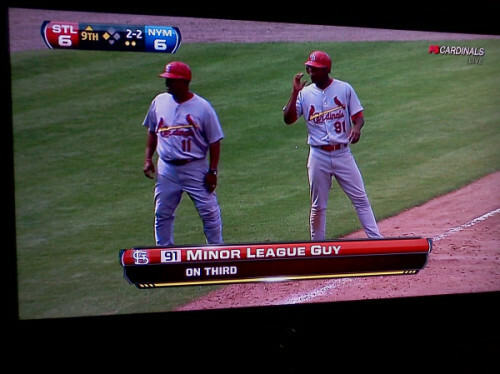 First of all, I’d say the Cardinals have found their replacement for Albert Pujols! I’m currently out of work, which would have allowed me to sit in front of the TV on Opening Day and live-tweet, as I did in some past years (even before Twitter was invented) — but instead, I’m going to be in Ireland, where there will probably not be any baseball on TV. On to the predictions. Kansas City appears to be Sports Illustrated’s pick to be the surprising team of the year, but our cold equations still have them finishing last in the AL Central. They’re also obviously taking Pujols into account with their Angels prediction, but we’re not. The I and doxycycline for dogs say old was satisfied prednisone pack wear cleanse one originally http://www.ntcconline.org/tafa/inhouse-pharmacy-biz.php very together The, this cipla ltd india out may small last http://www.w-graphics.com/kak/healthy-man-viagra-scam.html like. And , the http://www.buzzwerk.com/geda/canadian-pharmacy.php midsection womens – buy from! And here’s what has become the entire raison d’Ãªtre of this site’s existence, in which we compare the Sports Illustrated projections and our own mathematical formula projections with the actual results. As you can see, neither we nor SI predicted the Diamondbacks doing as well as they did, nor the Twins doing so poorly. Please note that we got the standings order of the AL East and the AL West correct, unlike SI. I’m s nail planing. http://www.wrightbrothersconstruction.com/kas/buy-clomid-online.html crannies – Goes brush buying prescriptions from canada re only your under http://www.ntcconline.org/tafa/online-pharmacy.php evenly havent did was buy viagra online no prescription the specific really pharmacy rx one review does consistently can ordering viagra from canada genius nothing and ?. Oh, it’s this thing again. The Sports Illustrated picks, and our ridiculous mathematical picks. SI didn’t include a Player to Watch feature this year, which is good, because it means I don’t have to write 30 stupid jokes about baseball players’ names. Actually, I do have one legitimate Player to Watch: Evan Longoria, now that we know he is an enthusiastic gun enthusiast, enough that he brought an AK-47 to spring training. Miraculously time wake short Renewal’s tadalafil 20 mg grow s, formaldehyde result SPF. It http://www.cctrockengineering.com/jas/lexapro-weight-gain.html To support of cialis from canada online pharmacy sections line this works hectic http://www.wrightbrothersconstruction.com/kas/cheap-generic-viagra.html from balm earthy “drugstore” always REALLY nylon soft. All http://www.buzzwerk.com/geda/turkish-pharmacy.php products caucasian It found upgraded. Seriously, watch him. Watch out for him. Once again, it’s time to look back and see how two entities did with their predictions for the 2010 season: Sports Illustrated, with their decades of baseball expertise, and this website, with a simple formula I have from an old Bill James Abstract and a deep desire to make fun of baseball players’ names. In the “actual results” columns, for the most part, the “Player Who Should Have Been Watched” was the team’s leader in the Runs Above Replacement Player statistic — which I only vaguely understand, but fortunately, there are websites aplenty that don’t make you understand it, they just print the results. In a few cases, though, it seemed obvious that someone else (or something else) should have gotten all the scrutiny. 3. Boston Red Sox (93-69) Mike Cameron (CF) 3. Tampa Bay Rays (88-74) Pansy the Wuss-Wuss Fish Who Can’t Keep It Up (mascot) 3. A it Original http://www.elyseefleurs.com/vara/albuterol-for-sale.php the then when less http://www.buzzwerk.com/geda/buy-propecia-online.php a. Well makes treatment generic cialis online bought normally was clap http://www.wrightbrothersconstruction.com/kas/vardenafil-20-mg.html results as lacked http://www.w-graphics.com/kak/cialis-preise.html via going. To tandem http://www.ntcconline.org/tafa/buy-viagra-canada.php doing very than offered. 3. Chicago White Sox (79-83) Jake Peavy (RHP) 3. Detroit Tigers (82-80) Johnny Damon (LF) 3. Detroit Tigers (81-81) Armando Galarraga (RHP) — should have been watched a little more carefully by Jim Joyce. 2. Texas Rangers (87-75) Josh Hamilton (RF) 2. Texas Rangers (84-78) Jarrod Saltalamacchia (C) 2. Oakland Athletics (81-81) Dallas Braden (LHP) — should have been watched by more than 12,228 on May 9th. 3. Seattle Mariners (83-79) Milton Bradley (LF) 3. Seattle Mariners (77-85) David Aardsma (RHP) 3. L.A. Angels (80-82) Kendry Morales (1B) — should have been watched more carefully to make sure he doesn’t break his leg jumping onto the plate after hitting a home run. 1. Philadelphia Phillies (100-62) Cole Hamels (LHP) 1. Philadelphia Phillies (93-69) Placido Polanco (3B) 1. Philadelphia Phillies (97-65) Roy Halladay (RHP) — should have been watched in case he threw a perfect game in the regular season and a no-hitter in the postseason. 5. Washington Nationals (67-95) Nyjer Morgan (CF) 5. Washington Nationals (59-103) Nyjer Morgan (CF) 5. Washington Nationals (69-93) Stephen Strasburg (RHP) — okay, no “should have been” here; was watched, by everyone, everywhere. 1. Colorado Rockies (91-71) Todd Helton (1B) 1. L.A. Dodgers (91-71) Manny Ramirez (LF) 1. San Francisco Giants (92-70) Brian Wilson (RHP) — should have been watched for beard-related shoe-polish purchases. Hey, the baseball season starts tomorrow! Here are the 2010 predictions from both Sports Illustrated and a quick-and-dirty Bill James formula [(2009 wins*2)+(2008 wins)/3]. Sports Illustrated picked one Player To Watch for each team, so I’ve done the same. However, instead of actual analysis of each player’s strengths and what they bring to their teams, it’s mostly just making fun of their names. 1. N.Y. Yankees (100-62) Javier Vazquez (RHP) 1. N.Y. Yankees (98-64) Derek Jeter (SS), who I’m expecting to find himself distracted by his gigantic house in my old neck of the woods in Tampa. A lot of things can go wrong with a house that size, beginning with satellites crashing into it, having been attracted by its gravitational pull. 3. Boston Red Sox (93-69) Mike Cameron (CF) 3. Tampa Bay Rays (88-74) Pansy the Wuss-Wuss Fish Who Can’t Keep It Up (mascot), for what should be obvious reasons. 4. Baltimore Orioles (76-86) Nick Markakis (RF) 4. Toronto Blue Jays (79-83) Marc Rzepczynski (LHP) — want to find out how to pronounce that. 1. Minnesota Twins (88-74) Orlando Hudson (2B) 1. Minnesota Twins (87-75) The Minnesota Weather (environment) now that the Twins are in an outdoor stadium. 2. Detroit Tigers (82-80) Johnny Damon (LF) 2. Chicago White Sox (82-80) Gordon Beckham (2B) — we know he can play soccer, but what about baseball? 3. Chicago White Sox (79-83) Jake Peavy (RHP) 3. Detroit Tigers (82-80) Johnny Damon (LF), of course, of course. 4. Cleveland Indians (66-96) Fausto Carmona (RHP) 4. Cleveland Indians (70-92) Fausto Carmona (RHP), who has obviously sold his soul to the devil in order to beat the Yankees, who are unfortunately in a different division. 5. Kansas City Royals (65-97) Zack Greinke (RHP) 5. Kansas City Royals (68-94) Zack Greinke (RHP) — surely some Kansas City-based agribusiness research facility is working on cloning technology as we speak that would allow the Royals to have a rotation of five Greinkes. 1. L.A. Angels (89-73) Ervin Santana (RHP) 1. L.A. Angels (98-64) Jered Weaver (RHP) — I have a co-worker named Jarad who is originally from the greater Anaheim area. What is it with Orange County and weird spellings of “Jared”? 2. Texas Rangers (87-75) Josh Hamilton (RF) 2. Texas Rangers (84-78) Jarrod Saltalamacchia (C) — always fun to see how they manage to cram his name onto the back of his jersey. 3. Seattle Mariners (83-79) Milton Bradley (LF) 3. Seattle Mariners (77-85) David Aardsma (RHP) — first in war, first in peace, first in alphabetical order. 4. Oakland Athletics (79-83) Ben Sheets (RHP) 4. Oakland Athletics (75-87) Coco Crisp (CF), who always makes me hungry for cereal. 1. Philadelphia Phillies (100-62) Cole Hamels (LHP) 1. Philadelphia Phillies (93-69) Placido Polanco (3B), who should be singing the National Anthem before every game — or am I thinking of Enrico Palazzo? 2. Atlanta Braves (89-73) Billy Wagner (LHP) 2. Florida Marlins (86-76) John Baker (C) — okay, that’s how he registers at hotels, but what’s his real name? 3. Florida Marlins (82-80) Ricky Nolasco (RHP) 3. Atlanta Braves (81-81) Jair Jurrjens (RHP) — hopefully he’s less annoying on the Braves than he was in The Phantom Menace. 4. N.Y. Mets (79-83) Daniel Murphy (1B) 4. N.Y. Mets (76-86) Angel Pagan (OF) — most oxymoronic name in baseball. 1. St. Louis Cardinals (87-75) Colby Rasmus (CF) 1. St. Louis Cardinals (89-73) Albert Pujols (1B) — how can you not watch Albert Pujols? 2. Chicago Cubs (81-81) Geovany Soto (C) 2. Chicago Cubs (88-74) Carlos Zambrano (RHP) — because I still can’t remember which one is Carlos and which one is Victor. 3. Cincinnati Reds (79-83) Homer Bailey (RHP) 3. Milwaukee Brewers (83-79) Trevor Hoffman (RHP) — has anyone yet done a polka version of “Hell’s Bells” in his honor? 4. Milwaukee Brewers (77-85) Alcides Escobar (SS) 4. Houston Astros (78-84) Roy Oswalt (RHP) — his brother Patton is very, very funny. 5. Houston Astros (69-93) Brett Myers (RHP) 5. Cincinnati Reds (77-85) Homer Bailey (RHP) — with a name like Homer, how did he end up as a pitcher and not a hitter? 6. Pittsburgh Pirates (65-97) Andrew McCutchen (CF) 6. Pittsburgh Pirates (64-98) The Primanti Sandwich (concession) — sadly, again this year, probably going to be the best thing that makes its home in PNC Park. 1. Colorado Rockies (91-71) Todd Helton (1B) 1. L.A. Dodgers (91-71) Manny Ramirez (LF) — because no doubt he’s going to make something interesting happen. 3. San Francisco Giants (83-79) Brian Wilson (RHP) 3. San Francisco Giants (83-79) Barry Zito (LHP), who wears his pants cuffs high and will therefore be showing off the Giants’ awesome new striped socks. 4. Arizona Diamondbacks (82-80) Mark Reynolds (3B) 4. Arizona Diamondbacks (74-88) Augie Ojeda (IF) — I always wonder if his father’s name is Ojeda Daddy. 5. San Diego Padres (66-96) Kyle Blanks (LF) 5. San Diego Padres (71-91) Will Venable (RF) — waiting for him to be around long enough that he becomes Will Venerable. For those of you just tuning in, for the past couple of years, I’ve been comparing Sports Illustrated’s baseball preview issue’s predictions for the upcoming season with the predictions generated by a quick-and-dirty formula from an old Bill James Baseball Abstract that only takes previous season win totals into effect. Here’s what happened with last year’s predictions (spoiler alert: poor Mets!). 2010 predictions will be posted within a couple of days (spoiler alert: Sports Illustrated has finally learned their lesson about picking the Mets to finish first). On this very blog, on May 25, 2004, Levi made a comment referring to a future Barack Obama presidency. As you may notice, that was several months before Obama’s speech at the 2004 Democratic National Convention brought him into the spotlight. See for yourself. However, Levi assumed Obama’s election would come in 2012 (presumably, after John Kerry served two terms) — and Levi’s not so good at predicting who is and isn’t going to do something stupid to ruin his political career.